An itinerary that includes the southern region of Narragansett Bay requires careful planning. There’s too much to do. Charming, historic, rustic and sophisticated, towns and traditions stay strong in Rhode Island. Shops of curiosities have flowering window boxes. Children clutching silver pails forage for a clambake. Artists capture the crispness in the air. Pelicans have free passage on working boats. After work, townies gather at pubs to laugh with friends. Step off the passerelle and you’re just steps from the town. 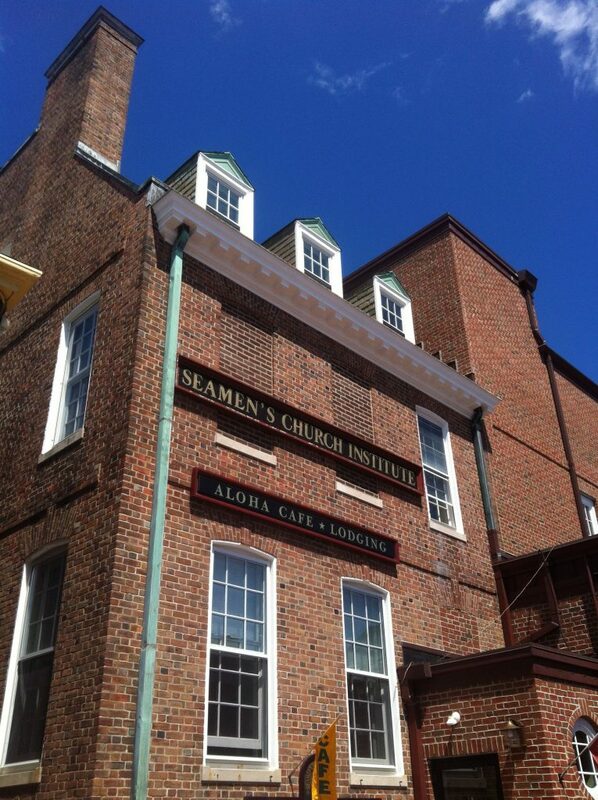 This thriving, colonial seaport, with shipbuilding and seagoing roots, was founded in 1639. Today, 18th and 19th century buildings of bricks, beams and gingerbread trim surround the port. Narrow sidewalks straddle cobbled streets. It’s a colonial motif that’s emblematic of coastal New England. 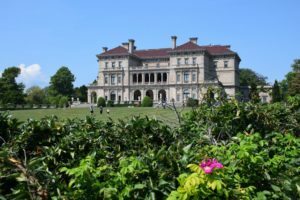 In the late 1800s, Newport Rhode Island was the summer playground of America’s wealthiest families, including the Vanderbilts, the Astors and the Morgans. 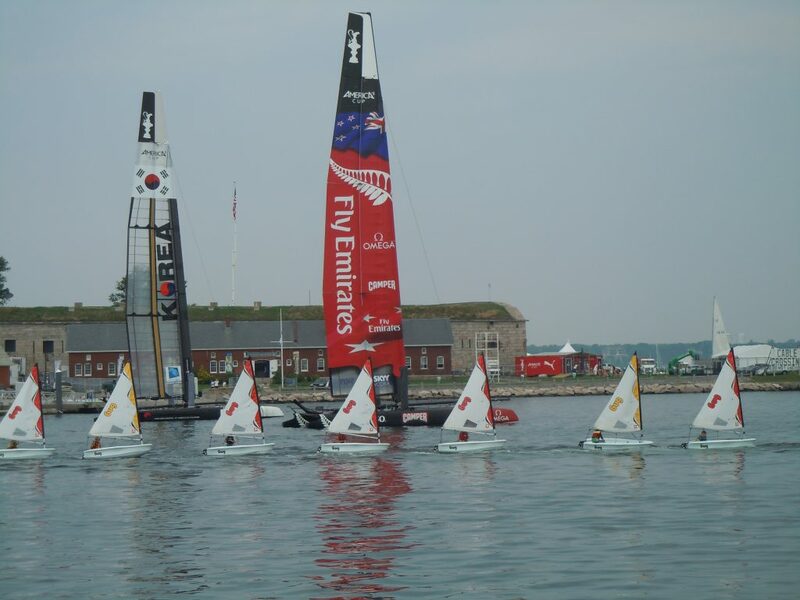 They raced their yachts in Narragansett Bay. They relaxed on Bailey’s Beach and played tennis at the Newport Casino. They constructed million dollar mansions where they hosted extravagant parties. Newport’s palatial, Victorian mansions are notoriously expensive to maintain. Many in a neglected state have recently become hot properties competitively bid on as vacation homes by preservationist millionaires. As new money moves in, and elite society expands, history seems poised to repeat itself. For yachtsmen, the influx of capital is a positive trend. Larry Ellison, the billionaire founder of Oracle, purchased Beechwood mansion in 2010, and two adjacent properties in 2012. He filed plans to restore Beechwood as a public museum for his 19th-century art collection. 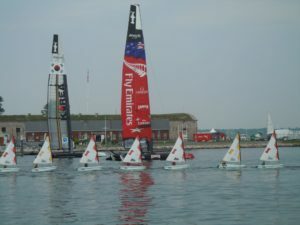 At the time, local yachtsmen correctly predicted that Ellison and his BMW-Oracle Racing team were favoring Newport as the host of the America’s Cup races. Newport is a bustling seaport town where historical wonders and inspirational modern achievements are often found side by side. Yachting enthusiasts will feel at home. There are yacht races and sports clubs, lovely beaches, trails for hiking and biking and a delightful downtown area to poke around in. 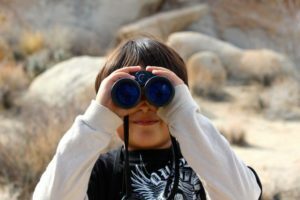 If you only have a day on your itinerary, you will find it is hardly enough to see and do everything. The Breakers, ca 1895, a National Historic Landmark, was the summer home of Cornelius Vanderbilt II. The Elms, ca. 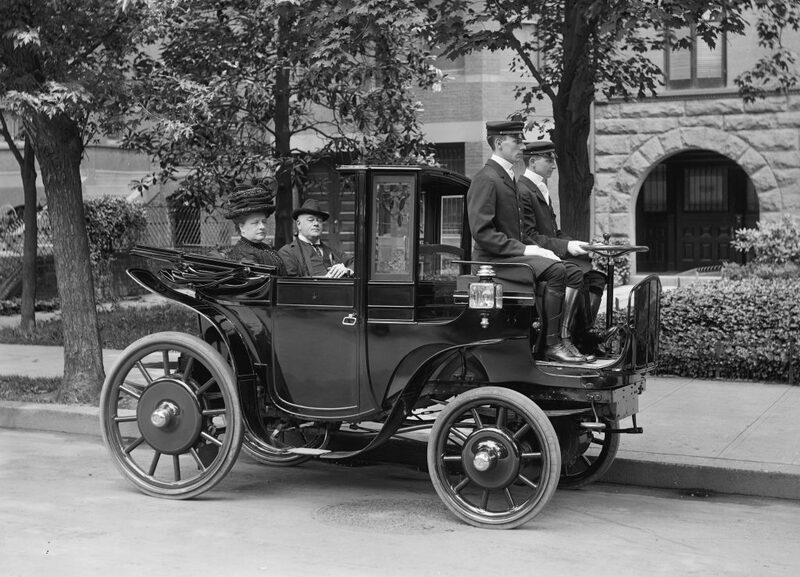 1901, modeled after the French chateau d’Asnieres outside Paris. Beautiful terraces, sunken garden and Venetian paintings. 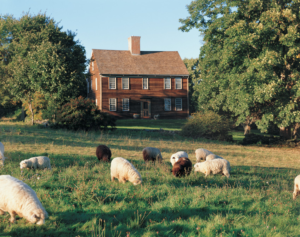 Hammersmith Farm: Childhood home of Jacqueline Kennedy and “summer White House” during the Kennedy administration; also the last working farm in Newport; playhouse garden; miniature horses. Belcourt Castle, ca. 1891, Louis XII castle has fine collection of art and antiques from 32 European and Asian countries. The Newport Music Festival puts on performances by world-class musicians at the mansions. Dates for the 48th season will be July 8 – 24, 2016. The Newport Cliff Walk is a National Recreation Trail that runs for 3.5 miles along the picturesque coastline passes the extraordinary Gilded Age mansions. Tender in, kayak, or swim ashore. There is a dock space for visitor tie-ups. This tiny island with nesting birds and historic lighthouse is of interest. Candy Store Cup, annual superyacht regatta, July 29-31, 2016 (formerly Newport Bucket). In 1980, a group of New England yachtsmen founded the Classic Yacht Regatta. The Museum of Yachting organized the first event, and forty wooden classics came to the starting line. Now more than 30 years old, the weekend is a spectacle of beautiful vintage yachts in several classes. 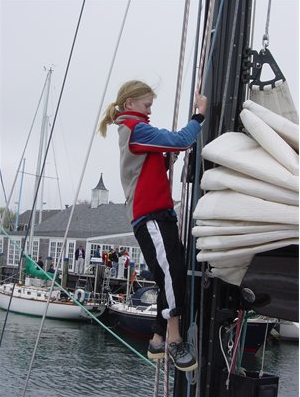 The Classic Yacht Regatta includes events on and off the water and is great for family fun. International Tennis Hall of Fame: world’s largest tennis museum, a visual and interactive experience. The Hall of Fame Tennis Club boasts 13 manicured grass courts you can arrange to play on. Talented tennis instructors will get you inspired. Spiced Pear, in the historic Chanler hotel on the north end of the Cliff Walk. Fine-dining, silver service, and magnificent water views. Classic French technique influences New England traditional fare. 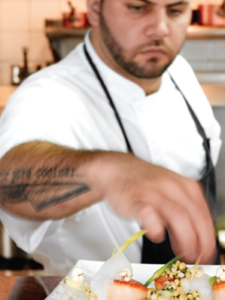 Multi-course tasting menu pairs regional specialties with fine wines. Light bites and signature martinis at the bar. Friday night jazz. Tel: 401-847–2244. 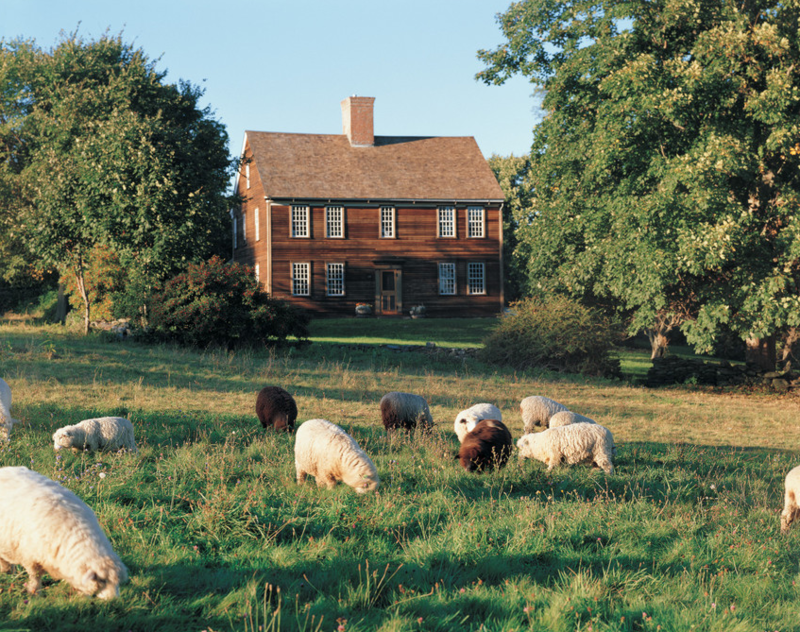 Jamestown, on Conanicut Island, is rural, traditional, small town Americana at its most picturesque. Sheep have been grazing here since the time of Newport’s founding in the sixteen-thirties. Some buildings date back centuries. The 6,000 or so residents know who’s who. But don’t imagine this historic seaport is behind the times. Jamestown residents enjoy some very chic spots for shopping, dining and entertainment. Plan to spend an hour or two in town browsing the four fine art galleries, gourmet grocery and upscale boutiques. Historic properties include a Fire Department Museum of oddities housed in the garage that was once the actual fire company. The Jamestown Museum and Town Hall sit side by side on Narragansett Avenue. Walk or bike north on North Road to have a look inside the smock windmill, built in 1787. Nearby, the 100-year-old Quaker Meeting house has worship services on summer Sundays. Pass through a scenic landscape of surrounding fields and farmland and connect to the past. 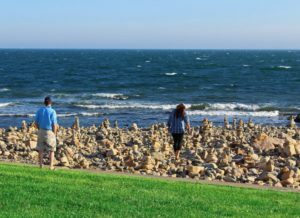 At the end of Broad Street off East Shore Road, on the northeast end of Conanicut Island, is a right-of-way to a quiet, rocky beach with a spectacular view of upper Narragansett Bay and the entrance to Mount Hope Bay. 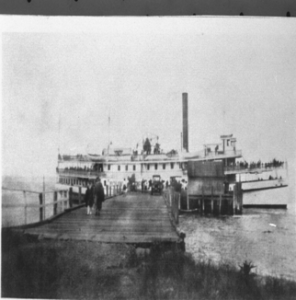 In the early 1900s, this was the location of a steamboat landing for travel between Providence, Jamestown, and Newport. 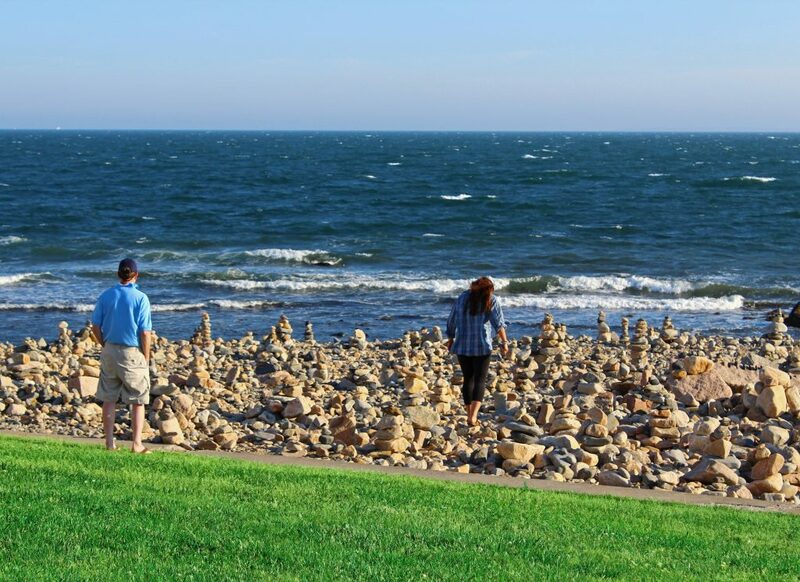 Head south to Beavertail, the southernmost part of Conanicut Island. Have your crew prepare a picnic basket. This picturesque nature reserve is a perfect spot for lunch outdoors. The rocky, windswept point has hosted beacons and lighthouses since at least 1705. 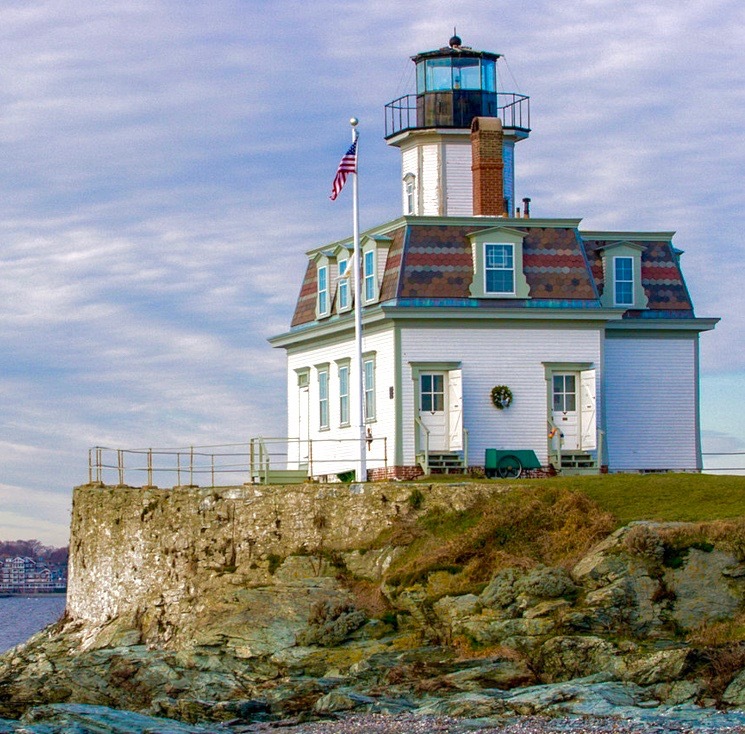 Beavertail lighthouse, built in 1856, is the third oldest lighthouse in America. 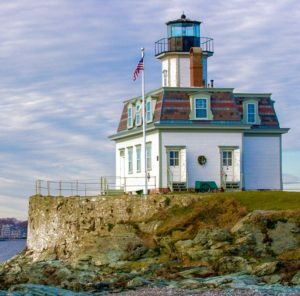 Beavertail Lighthouse Museum is situated in a popular nature park and includes two 19th century fog-signal and gatekeeper’s buildings and a shipwreck database of Rhode Island maritime events from Colonial times to the present. 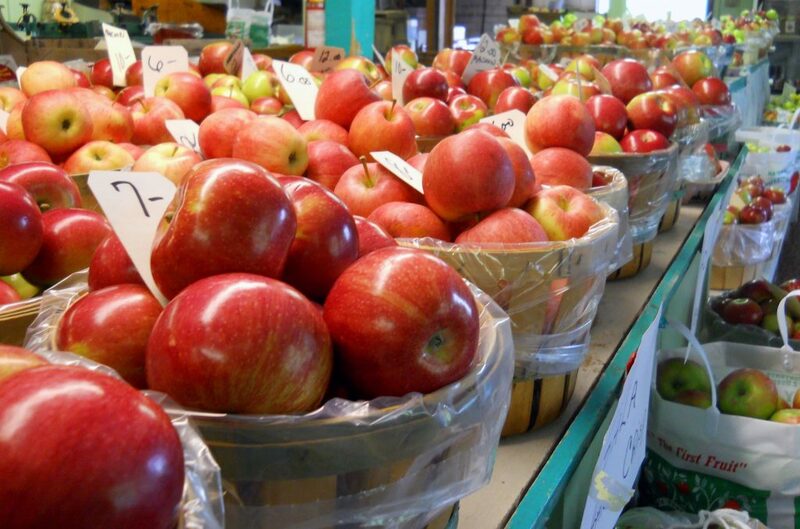 Watson Farm, 1796 is a scenic 265-acre working family farm that uses innovative sustainable practices. Visitors are free to explore on a self-guided tour walking tour. Open Tuesday, Thursday, and Sunday, June 1 – October 15, 1:00 – 5:00 p.m.
Grapes & Gourmet: Excellent for provisioning fine wines and gourmet food. 9 Ferry Wharf (at Conanicut Marina) (401) 423-0072. Randall Art Gallery: Two-story building featuring works by more than a dozen local artists in various media, plus special exhibits of other regional artists. Open Thursdays through Mondays, 65 Narragansett Avenue (401) 423-0707. This island is about 12 miles off Rhode Island’s southern coast. 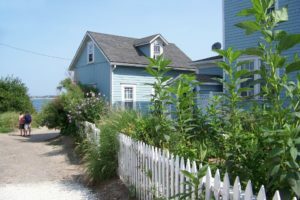 It is a favorite of sailors, fresh and saltwater fishermen, artists, antique lovers and architecture enthusiasts, hikers, bikers, surfers and beachcombers. 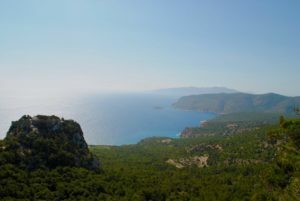 Nearly half of the island is protected by preservation laws and remains pristine. At Great Salt Pond, dock at one of three marinas, or anchor out and tender ashore. On summer weekends this commercial area along the south shore is crowded with sailors, yachtsmen, race teams and fishing tournament participants. About a mile away, the Old Harbor is a delightful ramble, with restaurants, shops and museum quality galleries. 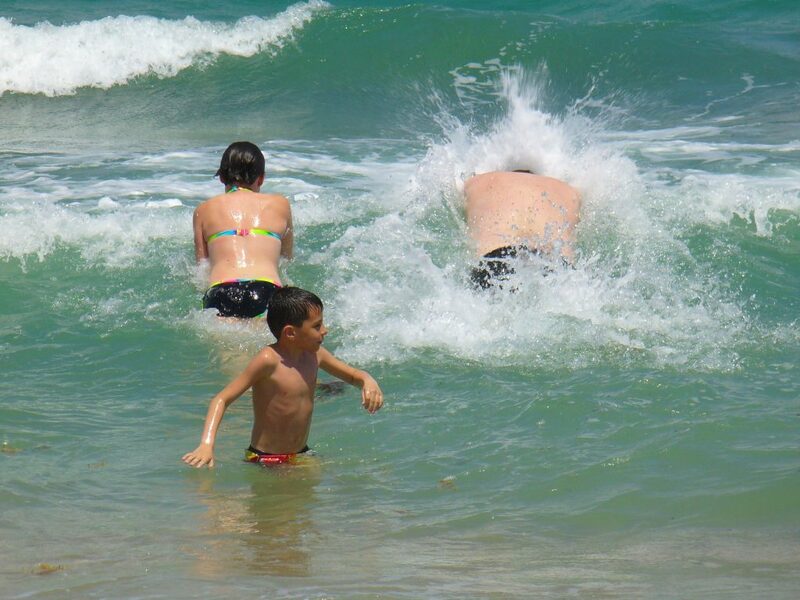 Block Island is a family favorite. There are some 17 miles of sandy beaches featuring spectacular bluffs, fun to scramble about at any age. Trail systems of varying skill levels criss-cross the island. There are hundreds of freshwater ponds, unique flora and fauna, and a 150-year-old lighthouse to investigate. Surfers should head to Jerry’s Point to catch the best waves. The unusual Manisses Animal Farm and Petting Zoo is an island treasure that shelters kangaroos, camels, a zeedonk, fainting goats, lemurs, lamas and other friendly, furry, hand-fed creatures. 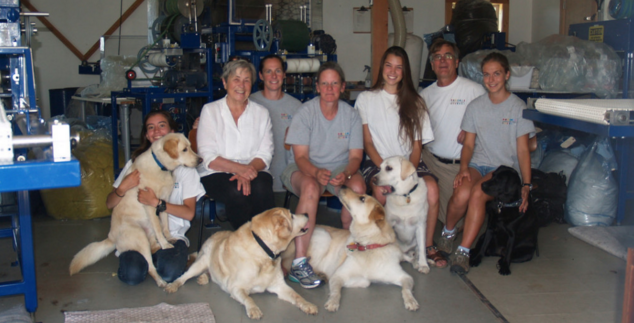 At the farm center, the Micro Yarn Mill makes yarn from the animal fibers. North Light Fibers manages the process from fleece to skein. At the shop in Old Harbor, knitters can take a class or buy unusual yarns. They sell lovely knit and hand woven-garments and home décor. Jessie Edwards Studio, contemporary American paintings, works on paper, wood turnings, and fine ceramics. The gallery is on the second floor of the Block Island Post Office building overlooking Old Harbor. The Atlantic Inn, Restaurant 1879 has award winning wine list and cuisine. Dine in historic surroundings with breathtaking views. Just outside of Old Harbor. The Select Yachts team has been on the ground in Newport, Jamestown and Block Island, RI. We attend the Newport Charter Yacht Show annually. We have toured both the yachts and destinations in the region. Contact us to share our personal insights and to help you book the perfect yacht charter vacation. We’ve been there. We know the ropes.